Metal Photo Art with Soundwave Media™ | Photo Art You Can Watch! | Soundwave Art™ - Turn your voice or sound into art! Turn your favorite photo into metal art! Upload your photo, then upload a video related to your photo. With our Soundwave Media™ technology you will be able to scan your metal using our mobile app and watch your video! 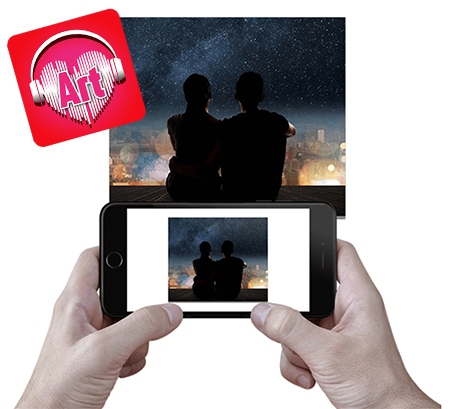 We use augmented reality to overlay your video on top of your artwork, merging the digital and physical world. See how it works below. Our Aluminum panels offer a slim 0.045" thickness, with rounded corners in a gloss finish. We use a full-color heat sublimation process with an enhanced coating for sustainability. Your print comes with a floating keyhole back so it is ready to hand and display immediately upon arrival. Available in USA & Canada, comes ready to hang. Your Soundwave Art™ is active with our app and stored for five (5) years at the time of purchase. When it expires you can renew the media package for another five (5) years for the price of $24.99.